Bernard Nussbaum ’58 was presented with the President’s Cup on June 6 at the Dean’s Breakfast during Alumni Reunion Weekend 2009. The Cup is awarded annually to an alumnus/a for contributions to his or her class’ reunion the previous year, and Nussbaum was a leader in event planning and fundraising for the Class of 1958’s 50th reunion. Following are his remarks upon receiving the Cup. 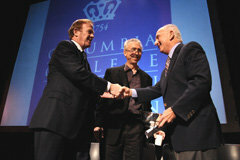 Bernard W. Nussbaum ’58 (right) shakes hands with Dean Austin Quigley upon receiving the President’s Cup, as V.P. of Arts and Sciences Nicholas Dirks looks on. PHOTO: EILEEN BARROSOLet me tell you all why this presentation means so much to me. I grew up in Manhattan on the Lower East Side. It was a tough and poor neighborhood then. In many respects, it is still a tough and poor neighborhood, although in recent years it has become somewhat gentrified. It now has a fancy name — the East Village. In the early 1950s it was not so fancy, but like many of you, I was born lucky. I was blessed with wonderful parents, who were immigrants. And I was able to go to a superb New York City high school, Stuyvesant. That is where I first heard of Columbia, where I first heard of the Ivy League. My Lower East Side was a long way from the Ivy League, but I wanted to take a crack a making it to what I considered the big time. And with the absolutely crucial help of a $350 Columbia scholarship and another $350 from the State of New York — tuition at Columbia was then $700 — I was able to come here. Tiny as they may seem to you today, without those scholarships I would not be standing here today. For the first few years, I lived at home. And then, with the help of additional financial aid and a prize room — the Class of 1924 Prize Room — I was able to live on campus. Columbia was a great adventure for me. It was an adventure because of the quality of the people who surrounded me from the outset, particularly my classmates. Many became my friends in 1954 — that was 55 years ago, when I first stepped onto this campus — and many are still my friends. Columbia was also an adventure to me because of the faculty — remarkable people who pushed you, made you read, made you write, made you think and made you question your own assumptions. Some say college is not the real world. I say nonsense. Because learning to think, to analyze, to work, to separate the sensible from the foolish, are all necessary to survive in the so-called real world. Indeed, those skills are necessary to triumph in that world. Columbia, finally, was a great adventure because of the activities it offered, the opportunities it provided. For me it was the Columbia Daily Spectator, the college newspaper. On Spectator, I ultimately became the editor-in-chief. In that position I became a pain in the neck to the University administration. For example, we ran a series of stories exposing slum housing in the Morningside area — and we exposed the fact that some of it was owned by Columbia University. The University administration was not very happy about those stories. Shortly after I stepped down as editor of Spectator, I ran into the president of the University, Grayson Kirk, at a gathering in the faculty club. I mentioned to him that I was applying to law school. I told him I was applying to Columbia Law School and to Harvard Law School. He looked at me and advised me to go to Harvard Law School. He said he thought it would broaden me. Well, I certainly did need broadening. That remains one of my favorite memories as a student — having the president of the University suggest that I pursue my graduate education elsewhere. But that was the wonder of this place. That you did not have to stay silent, that you could speak out, and you could flourish and grow. That is still the wonder of this place. Whatever I have achieved since Columbia, I owe in no small part to my days here. That is why I try to give back. That is why I accept this Cup with gratitude. Thank you.